The ARNT gene encodes the aryl hydrocarbon receptor nuclear translocator protein that forms a complex with ligand-bound aryl hydrocarbon receptor (AhR), and is required for receptor function. 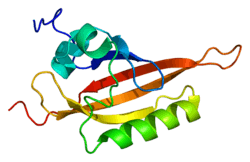 The encoded protein has also been identified as the beta subunit of a heterodimeric transcription factor, hypoxia-inducible factor 1 (HIF1). A t(1;12)(q21;p13) translocation, which results in a TEL-ARNT fusion protein, is associated with acute myeloblastic leukemia. Three alternatively spliced variants encoding different isoforms have been described for this gene. The aryl hydrocarbon receptor (AhR) is involved in the induction of several enzymes that participate in xenobiotic metabolism. The ligand-free, cytosolic form of the aryl hydrocarbon receptor is complexed to heat shock protein 90. Binding of ligand, which includes dioxin and polycyclic aromatic hydrocarbons, results in translocation of the ligand-binding subunit only to the nucleus. Induction of enzymes involved in xenobiotic metabolism occurs through binding of the ligand-bound AhR to xenobiotic responsive elements in the promoters of genes for these enzymes. ↑ Carver LA, Bradfield CA (April 1997). "Ligand-dependent interaction of the aryl hydrocarbon receptor with a novel immunophilin homolog in vivo". J. Biol. Chem. 272 (17): 11452–6. doi:10.1074/jbc.272.17.11452. PMID 9111057. ↑ Kazlauskas A, Sundström S, Poellinger L, Pongratz I (April 2001). "The hsp90 chaperone complex regulates intracellular localization of the dioxin receptor". Mol. Cell. Biol. 21 (7): 2594–607. doi:10.1128/MCB.21.7.2594-2607.2001. PMC 86890 . PMID 11259606. ↑ Lindebro MC, Poellinger L, Whitelaw ML (July 1995). "Protein-protein interaction via PAS domains: role of the PAS domain in positive and negative regulation of the bHLH/PAS dioxin receptor-Arnt transcription factor complex". EMBO J. 14 (14): 3528–39. PMC 394421 . PMID 7628454. ↑ Whitelaw M, Pongratz I, Wilhelmsson A, Gustafsson JA, Poellinger L (April 1993). "Ligand-dependent recruitment of the Arnt coregulator determines DNA recognition by the dioxin receptor". Mol. Cell. Biol. 13 (4): 2504–14. PMC 359572 . PMID 8384309. ↑ Yamaguchi Y, Kuo MT (October 1995). "Functional analysis of aryl hydrocarbon receptor nuclear translocator interactions with aryl hydrocarbon receptor in the yeast two-hybrid system". Biochem. Pharmacol. 50 (8): 1295–302. doi:10.1016/0006-2952(95)02016-6. PMID 7488247. ↑ Mimura J, Ema M, Sogawa K, Fujii-Kuriyama Y (January 1999). "Identification of a novel mechanism of regulation of Ah (dioxin) receptor function". Genes Dev. 13 (1): 20–5. doi:10.1101/gad.13.1.20. PMC 316371 . PMID 9887096. 1 2 Hogenesch JB, Chan WK, Jackiw VH, Brown RC, Gu YZ, Pray-Grant M, Perdew GH, Bradfield CA (March 1997). "Characterization of a subset of the basic-helix-loop-helix-PAS superfamily that interacts with components of the dioxin signaling pathway". J. Biol. Chem. 272 (13): 8581–93. doi:10.1074/jbc.272.13.8581. PMID 9079689. 1 2 3 Woods SL, Whitelaw ML (March 2002). "Differential activities of murine single minded 1 (SIM1) and SIM2 on a hypoxic response element. Cross-talk between basic helix-loop-helix/per-Arnt-Sim homology transcription factors". J. Biol. Chem. 277 (12): 10236–43. doi:10.1074/jbc.M110752200. PMID 11782478. 1 2 Beischlag TV, Wang S, Rose DW, Torchia J, Reisz-Porszasz S, Muhammad K, Nelson WE, Probst MR, Rosenfeld MG, Hankinson O (June 2002). "Recruitment of the NCoA/SRC-1/p160 family of transcriptional coactivators by the aryl hydrocarbon receptor/aryl hydrocarbon receptor nuclear translocator complex". Mol. Cell. Biol. 22 (12): 4319–33. doi:10.1128/mcb.22.12.4319-4333.2002. PMC 133867 . PMID 12024042. 1 2 Probst MR, Fan CM, Tessier-Lavigne M, Hankinson O (February 1997). "Two murine homologs of the Drosophila single-minded protein that interact with the mouse aryl hydrocarbon receptor nuclear translocator protein". J. Biol. Chem. 272 (7): 4451–7. doi:10.1074/jbc.272.7.4451. PMID 9020169. ↑ Moffett P, Reece M, Pelletier J (September 1997). "The murine Sim-2 gene product inhibits transcription by active repression and functional interference". Mol. Cell. Biol. 17 (9): 4933–47. doi:10.1128/mcb.17.9.4933. PMC 232345 . PMID 9271372. Haase VH (2006). "Hypoxia-inducible factors in the kidney.". Am. J. Physiol. Renal Physiol. 291 (2): F271–81. doi:10.1152/ajprenal.00071.2006. PMID 16554418. Reyes H, Reisz-Porszasz S, Hankinson O (1992). "Identification of the Ah receptor nuclear translocator protein (Arnt) as a component of the DNA binding form of the Ah receptor.". Science. 256 (5060): 1193–5. doi:10.1126/science.256.5060.1193. PMID 1317062. Hoffman EC, Reyes H, Chu FF, Sander F, Conley LH, Brooks BA, Hankinson O (1991). "Cloning of a factor required for activity of the Ah (dioxin) receptor.". Science. 252 (5008): 954–8. doi:10.1126/science.1852076. PMID 1852076. Yamaguchi Y, Kuo MT (1995). "Functional analysis of aryl hydrocarbon receptor nuclear translocator interactions with aryl hydrocarbon receptor in the yeast two-hybrid system.". Biochem. Pharmacol. 50 (8): 1295–302. doi:10.1016/0006-2952(95)02016-6. PMID 7488247. Wang GL, Jiang BH, Rue EA, Semenza GL (1995). "Hypoxia-inducible factor 1 is a basic-helix-loop-helix-PAS heterodimer regulated by cellular O2 tension.". Proc. Natl. Acad. Sci. U.S.A. 92 (12): 5510–4. doi:10.1073/pnas.92.12.5510. PMC 41725 . PMID 7539918. Lindebro MC, Poellinger L, Whitelaw ML (1995). "Protein-protein interaction via PAS domains: role of the PAS domain in positive and negative regulation of the bHLH/PAS dioxin receptor-Arnt transcription factor complex.". EMBO J. 14 (14): 3528–39. PMC 394421 . PMID 7628454. Abbott BD, Probst MR, Perdew GH (1995). "Immunohistochemical double-staining for Ah receptor and ARNT in human embryonic palatal shelves.". Teratology. 50 (5): 361–6. doi:10.1002/tera.1420500507. PMID 7716743. Reisz-Porszasz S, Probst MR, Fukunaga BN, Hankinson O (1994). "Identification of functional domains of the aryl hydrocarbon receptor nuclear translocator protein (ARNT).". Mol. Cell. Biol. 14 (9): 6075–86. doi:10.1128/mcb.14.9.6075. PMC 359134 . PMID 8065341. Johnson B, Brooks BA, Heinzmann C, Diep A, Mohandas T, Sparkes RS, Reyes H, Hoffman E, Lange E, Gatti RA (1993). "The Ah receptor nuclear translocator gene (ARNT) is located on q21 of human chromosome 1 and on mouse chromosome 3 near Cf-3.". Genomics. 17 (3): 592–8. doi:10.1006/geno.1993.1377. PMID 8244375. Whitelaw M, Pongratz I, Wilhelmsson A, Gustafsson JA, Poellinger L (1993). "Ligand-dependent recruitment of the Arnt coregulator determines DNA recognition by the dioxin receptor.". Mol. Cell. Biol. 13 (4): 2504–14. PMC 359572 . PMID 8384309. Jiang BH, Rue E, Wang GL, Roe R, Semenza GL (1996). "Dimerization, DNA binding, and transactivation properties of hypoxia-inducible factor 1.". J. Biol. Chem. 271 (30): 17771–8. doi:10.1074/jbc.271.30.17771. PMID 8663540. Rowlands JC, McEwan IJ, Gustafsson JA (1996). "Trans-activation by the human aryl hydrocarbon receptor and aryl hydrocarbon receptor nuclear translocator proteins: direct interactions with basal transcription factors.". Mol. Pharmacol. 50 (3): 538–48. PMID 8794892. Ema M, Morita M, Ikawa S, Tanaka M, Matsuda Y, Gotoh O, Saijoh Y, Fujii H, Hamada H, Kikuchi Y, Fujii-Kuriyama Y (1996). "Two new members of the murine Sim gene family are transcriptional repressors and show different expression patterns during mouse embryogenesis.". Mol. Cell. Biol. 16 (10): 5865–75. PMC 231588 . PMID 8927054. Swanson HI, Yang Jh (1997). "Mapping the protein/DNA contact sites of the Ah receptor and Ah receptor nuclear translocator.". J. Biol. Chem. 271 (49): 31657–65. doi:10.1074/jbc.271.49.31657. PMID 8940186. Probst MR, Fan CM, Tessier-Lavigne M, Hankinson O (1997). "Two murine homologs of the Drosophila single-minded protein that interact with the mouse aryl hydrocarbon receptor nuclear translocator protein.". J. Biol. Chem. 272 (7): 4451–7. doi:10.1074/jbc.272.7.4451. PMID 9020169. Hogenesch JB, Chan WK, Jackiw VH, Brown RC, Gu YZ, Pray-Grant M, Perdew GH, Bradfield CA (1997). "Characterization of a subset of the basic-helix-loop-helix-PAS superfamily that interacts with components of the dioxin signaling pathway.". J. Biol. Chem. 272 (13): 8581–93. doi:10.1074/jbc.272.13.8581. PMID 9079689. Carver LA, Bradfield CA (1997). "Ligand-dependent interaction of the aryl hydrocarbon receptor with a novel immunophilin homolog in vivo.". J. Biol. Chem. 272 (17): 11452–6. doi:10.1074/jbc.272.17.11452. PMID 9111057. Ema M, Taya S, Yokotani N, Sogawa K, Matsuda Y, Fujii-Kuriyama Y (1997). "A novel bHLH-PAS factor with close sequence similarity to hypoxia-inducible factor 1alpha regulates the VEGF expression and is potentially involved in lung and vascular development.". Proc. Natl. Acad. Sci. U.S.A. 94 (9): 4273–8. doi:10.1073/pnas.94.9.4273. PMC 20712 . PMID 9113979. Moffett P, Reece M, Pelletier J (1997). "The murine Sim-2 gene product inhibits transcription by active repression and functional interference.". Mol. Cell. Biol. 17 (9): 4933–47. doi:10.1128/mcb.17.9.4933. PMC 232345 . PMID 9271372.